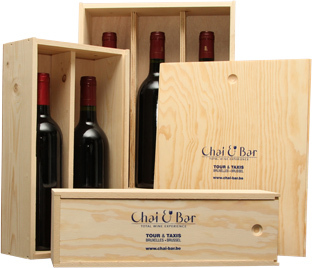 Excellent tool to win the loyalty of your clients, to motivate your co-workers, or to reward your distributors, the business gift is one of CHAI & BAR’s specialities. Wines, champagnes and spirits are presented in made-to-order gift boxes according to your tastes and your budget, personalized with your business card. All year long, our refined selection and expert advice from our sommeliers will enable you to choose the right gift to offer up. Prestigious labels to please, discoveries for new taste experiences, or wines to drink now as well as vintages for keeping. Our commitment to excellent service includes delivery, on schedule and via a specialized transport service.